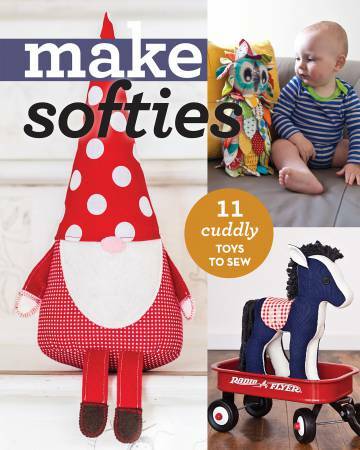 If you want to sew up a quick gift, make a toy for a baby or toddler, or decorate your home with a little whimsy, look no further than this collection of 11 softies from popular designers Amy Adams, Kirstyn Cogan, Samantha Cotterill, Abby Glassenberg, Jill Hamor, Brenna Maloney, Sweetwater, Kasja Wikman, Annabel Wrigley, and Angela Yosten. Cute houses, cuddly creatures, friendly characters, and even a checkerboard are all achievable with three-dimensional sewing for beginners and experienced sewists. Plus, the projects in this value-packed book will use up your scraps, stash, and even your socks!